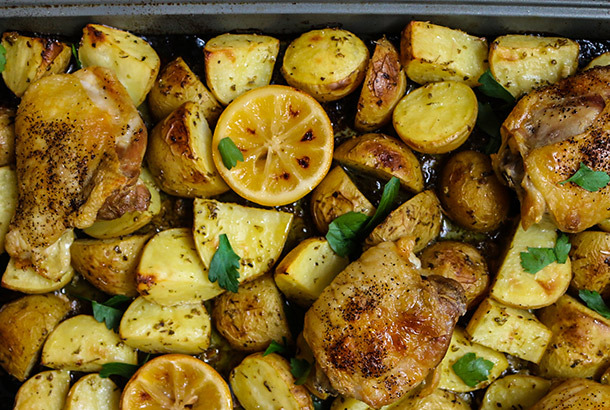 Roasted Greek chicken with lemon and potatoes has always been one of my favorite Greek foods. If you’ve never tried roasted Greek lemon potatoes before, you’re missing out. 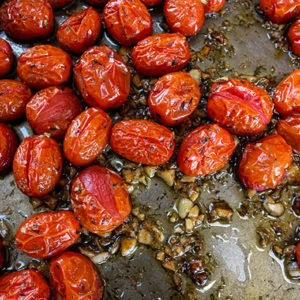 They glisten with golden extra virgin olive oil and get slightly crispy on the outside, and soft on the inside. The lemon and oregano give this sheet pan chicken the distinct flavor that is so classic to Greek cooking. 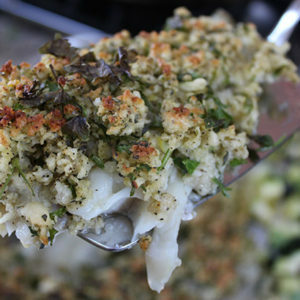 When I dip them in some cool refreshing tzatziki sauce, I might just eat the entire sheet pan. My favorite potatoes for this recipe are Yukon gold potatoes because of how golden and delicious they get. The skin on them is so thin I don’t even bother peeling them. If you’re using a potato with a thicker brown skin, peel the potatoes. Chicken thighs work great for this recipe because they stay moist and flavorful from the fat melting under the skin into the meat. Chicken breast can dry out easily when cooked in the oven like this, so even if you don’t use chicken thighs, try to find a cut of chicken that has some fat/skin to it. A little bit of mustard is used by a lot of Greek cooks in their lemon potatoes, it adds tang and flavor. Some cooks use regular yellow mustard but I like dijon for this recipe. If you don’t like mustard, don’t worry, it isn’t an overpowering flavor in this dish. 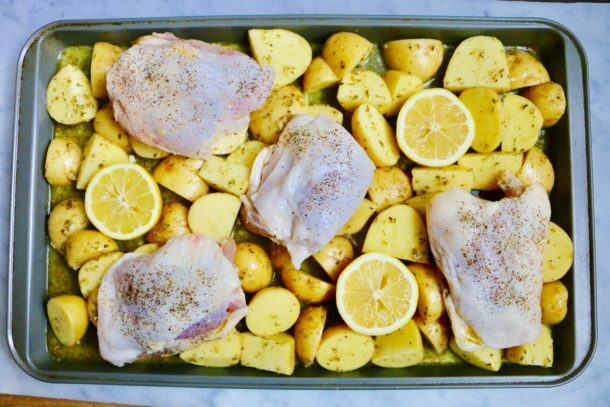 My favorite change to this traditional recipe is roasting lemons on the same pan as the chicken and potatoes. It looks great and if you want a really nice tart lemony flavor you can squeeze the cooked lemon on after. This traditional dish pairs beautifully with a traditional Greek salad. Tzatziki is a cool refreshing cucumber yogurt sauce loaded with dill and garlic that is the quintessential dipping sauce for these potatoes. Drizzle chicken thighs with olive oil and season with salt and pepper. Set aside. In a mixing bowl combine potatoes, salt, pepper, lemon juice, oregano, thyme, garlic, water, dijon mustard, and extra virgin olive oil. Mix well. 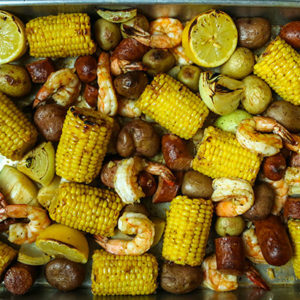 Pour potatoes onto sheet pan. Arrange lemon halves face up between potatoes. Arrange chicken thighs on top of potatoes. Bake at 400 F for an hour and twenty minutes. Remove and let cool for 5 minutes.